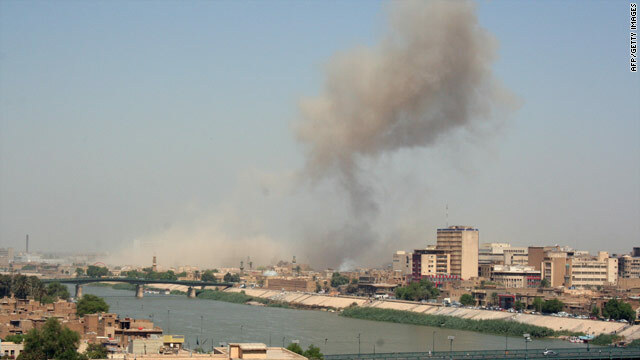 Smoke rises over an Iraqi military base hit by suicide bombers on Sunday in Baghdad. Baghdad, Iraq (CNN) -- U.S. military personnel were involved in repelling a suicide bombing attack Sunday on an Iraqi military base in Baghdad, four days after the United States officially ended its combat operations in Iraq. U.S. forces "provided suppressive fire" and helicopter support during the attack, said Lt. Col. Eric Bloom, a spokesman for the U.S. military in Baghdad. No U.S. soldiers were injured, Bloom said. At least 12 people were killed and 36 others were injured in Sunday's attack, the Iraqi military command said. The interior ministry reported eight dead and 21 wounded.There was no immediate explanation for the discrepancy. There was no immediate claim of responsibility for the attack, but a senior U.S. military official said American authorities believe al Qaeda in Iraq is responsible. The U.S. official said there were five attackers: the vehicle bomber, who detonated his explosive device; two vest bombers who were killed by the Iraqi army as they tried to get through the checkpoint but did not detonate; and two attackers, who got into a building next to the checkpoint inside the compound and detonated themselves before the Iraqi army could get to them. An Iraqi interior ministry official and the Baghdad Operations Command -- the Iraqi military command in the capital -- also said the attack was carried out by five suicide bombers. A CNN videographer was not allowed to videotape or get past the security perimeter at the scene, but reported that more than a dozen bodies were carried out more than four hours after the attack. The military base is the headquarters of the Rusafa Operations Command -- the Iraqi military command for the eastern part of Baghdad. Sunday's target was the same military base used as an Iraqi army recruitment center and attacked by a suicide bomber August 17. That bombing killed at least 48 people, most of whom were prospective recruits among hundreds lining up outside the center. The Islamic State of Iraq, an umbrella group for al Qaeda in Iraq, and other Sunni extremist groups claimed responsibility for that bombing. The group previously claimed responsibility for a similar attack in the heart of the capital on June 14 involving up to seven suicide bombers who struck the central bank. While U.S. and Iraqi government officials have voiced confidence in the ability of Iraqi security forces, recent attacks have raised concerns among the population about the fragile security situation. On August 28, the Iraqi government announced there were plots by al Qaeda and other groups to carry out attacks across the country and called on security forces and citizens to be on high alert. The recent violence comes amid a political crisis that has gripped the country for months. After inconclusive national elections almost six months ago, politicians are still wrangling to try to form a government. In a separate attack Sunday, at least five people were wounded in a roadside bombing in eastern Baghdad, the interior ministry said.